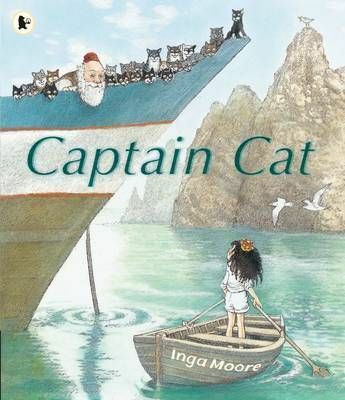 Let Inga Moore take you on an adventure with Captain Cat and his shipful of cats! New lands, an island Queen, untold treasures and glorious feasts ... it will be a journey like no other! Captain Cat is a trader. However, his eye is not for gold but for ...CATS! So much so, that his ship - the Carlotta - is populated by all kinds of felines! But one day, Captain Cat decides that it's time to give up his trading and, with his beloved cats in tow, visit all the places he has always dreamed of. Out on the sea, a rogue storm brews up and Captain Cat ends up on a remote island. Here, they meet an Island Queen who's beside herself with joy ...she has never seen a cat before! She prepares a huge feast in their honour, but - EWWW! A horde of hungry RATS emerge! Good thing Captain Cat has his ship full of cats! Amazed, the queen begs Captain Cat to trade her his cats for untold treasure. Does he? Could he? What happens next? Never fear, fellow travellers! The purr-fect solution is on the horizon and is sure to satisfy both pet-lovers and adventurers.